Today’s Nice Price or Crack Pipe Civic is incredibly clean for a car with over 200K on the clock. Let’s find out if it’s priced to clean out your wallet. Ford’s Fox Body Mustang has long been the bargain basement performance option with enough cheap aftermarket parts available to keep that performance going for years to come. I guess the $3,800 price tag on yesterday’s 1984 Mustang 5.0 convertible wasn’t basement enough for the 54 percent of you who dunned the car with a Crack Pipe loss. Based on the comments, the car’s odd color combination (white with barbie doll accents) had a lot to do with that result. 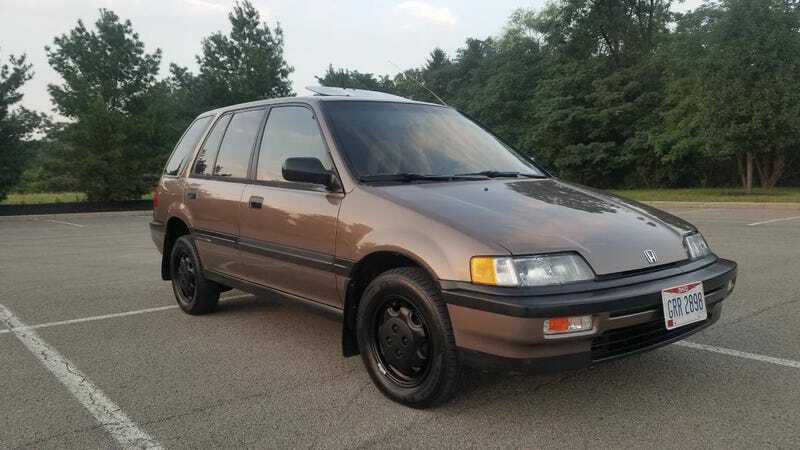 That Mustang may have been have been messed up by MAACO but that’s okay because today’s 1991 Honda Civic Shuttle comes to us in a soothing and cosseting factory Cappuccino Brown. Yep, it’s a brown wagon. Woot! Woot! Woot! The Civic Shuttle/Wagon was part of the fourth generation lineup, the last in fact to offer such a utilitarian form. This was back in the day when Honda still seemed to give a hot damn about market niches. Yeah, I know they now offer a five-door hatch so I think there’s hope still. Stylistically something of an anomaly, the Shuttle featured an extended greenhouse made all the more so in appearance by the car’s amazingly low hoodline. The proportions are funky without seeming cartoonish. For its fourth generation, Honda gave the Civic lineup a double wishbone suspension in the front to allow for a low hood and, in the case of the sedan and coupe, a remarkably low windshield base. The wagon gets a taller firewall and even taller roof providing a see and be seen greenhouse that was all the rage back in the late ‘80s and early ‘90s. Here that’s accentuated by an elevated ride height, a functional feature as the car rocks Honda’s Real Time on-demand AWD. It also comes with a D16A6 1.6-litre four under its sloping hood. That engine was shared with the Si of the time—not literally shared, there was in fact more than one—and cranked out 108 horsepower and 100 lb-ft of torque in both applications. In this application that SOHC four is joined in the fray by a four-speed automatic transmission. Yes I know we’d all rather it be a stick, but it’s not so let’s get over it. Besides, you’ll appreciate the fact that you have less to do inside the car as you’ll be dealing with the motorized mouse belts here, one of the auto industry’s less successful attempts at passive safety mechanisms before airbags came into common usage. They are intriguing the first time you see one, and super annoying at every following encounter. Fortunately, the interior on this Civic is in such excellent condition that you might not even notice the belts. It’s remarkable to have lasted this long with so little evidence of wear. More so in fact, considering the car rocks over 200,000 miles. A stereo from somewhere between its era and now seems to be the only concession to the aftermarket, and the ad says everything works as it should. The exterior is in likewise nice shape, with only some paint chipping from the aftermarket moonroof surround to detract. The wheels have been painted all black which is an okay choice, I guess. There is some fading on the back door window frames, but that’s very minor. The rub strips even still sport their REALTIME 4wd stickers. Mechanically, there’s a lot to like here too. The seller says that the car was originally from California and has never been driven in the winter. It’s also been garage kept and covered when not in use. Maintenance has included the standard fluid refreshes plus some hardware replacements, all with OEM materials when possible according to the ad. That included a new radiator, exhaust system—with cat!—and front pads and rotors. The current owner just did the timing belt and water pump 10K ago. You don’t see these old Civic wagons around much any more, and when you do, they’re rarely in as nice of shape as this one appears to be. These don’t offer much in the way of luxury or accoutrement, but they are about as fun and funky as Honda ever got with the Civic here in the States. The asking price for this wagon is $5,500, an amount that obviously reflects its condition more so than its miles. What do you think, could this survivor be worth that kind of scratch? Or, for asking that much do you think the seller of this tall Civic must be high? At $3,800, Could This 1984 Ford Mustang 5.0 Turn You Into A Fair Weather Friend?